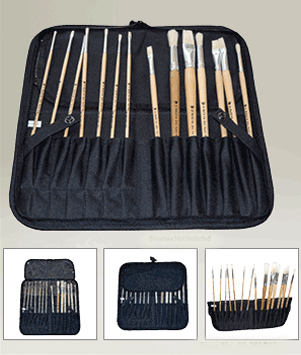 * The Weber Easel Back Brush Case will protect and transport up to 20 thin handled brushes or 10 thick handled brushes or for that matter, any variation thereof. * Our easel back brush clutch/case features a large, strong zipper, and a fold over protective flap with clear vinyl inside to preserve and protect from wet brushes. Open - 14.5" x 14.5" Closed - 7.25" x 7.25 "